Piggly-Wiggly, the first self service store, 1916. Retailing consists of the sale of goods or merchandise, from a fixed location, in small or individual lots for direct consumption by the purchaser. Purchasers may be individuals or businesses. Retailing may include subordinated services, such as delivery. In commerce, a retailer buys goods or products in large quantities from manufacturers or importers, either directly or through a wholesaler, and then sells smaller quantities to the end-user. Retailers are at the end of the supply chain. Manufacturing marketers see the process of retailing as a necessary part of their overall distribution strategy. Shops may be on residential streets, shopping streets with few or no houses, or in a shopping center or mall, but are mostly found in the central business district. Shopping streets may be for pedestrians only. Sometimes a shopping street has a partial or full roof to protect customers from precipitation. Retailers often provided boardwalks in front of their stores to protect customers from the mud. Mail-order business and online retailing, also known as e-commerce, are forms of retailing that do not have a physical shop, but rather, operate through having customers place orders after viewing images and/or descriptions of the products. Whatever the form, retail businesses all play the same role in facilitating the exchange of goods and services from the producers to the consumers. When the retail sector functions effectively, bringing mutual benefit to both sides, they are indispensable to society. On the other hand, if the retail sector fails to satisfy producers and/or consumers, it becomes an obstacle to harmony and prosperity. 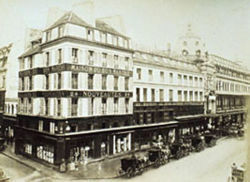 A Bon Marché department store in Paris, 1867. Retail comes from the French word, retaillier, to refer to "cutting off, clip and divide" in terms of tailoring used from 1365. It first was recorded as a noun with the meaning of a "sale in small quantities" in 1433 (French). Its literal meaning for retail was to "cut off, shred, paring." Like the French, the word retail in both Dutch and German (detailhandel and Einzelhandel respectively) also refer to sale of small quantities or items. 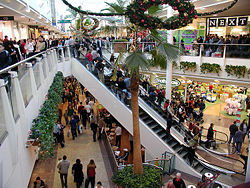 Retailing is the sale of goods or merchandise, from a fixed location such as a department store or kiosk, in small or individual lots for direct consumption by the purchaser. Buildings for retail have changed considerably over time. 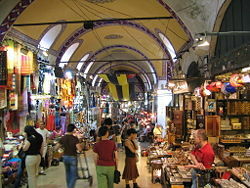 Market halls and bazaars, which were essentially just covered marketplaces, were constructed in the Middle Ages. The first shops in the modern sense used to deal with just one type of article, and usually adjoined the producer (baker, tailor, cobbler). In the nineteenth century, in France, arcades were invented, which were a street of several different shops, roofed over counters, each dealing with a different kind of article was invented; roofed over. From this, there soon developed, still in France, the notion of a large store of one ownership with many counters, each dealing with a different kind of article; it was called a department store. One of the novelties of the department store was the introduction of fixed prices, making haggling unnecessary, and browsing more enjoyable. In cities, these were multi-story buildings which pioneered the escalator. This is commonly considered the birth of consumerism. As the world's population has dramatically increased, the needs for consumer goods and services has skyrocketed. As such, the term "retailer" is also applied where a service provider services the needs of a large number of individuals, including utilities like telephone or electric power. There are three major types of retailing. The first is the marketplace, a physical location where buyers and sellers converge. Usually this is done in town squares, sidewalks, or designated streets and may involve the construction of temporary structures (market stalls). The second form is shop or store trading. Some shops use counter-service, where goods are out of reach of buyers, and must be obtained from the seller. This type of retail is common for small, expensive items (such as jewelry) and controlled items like medicine and liquor. Self-service, where goods may be handled and examined prior to purchase, has become more common since the twentieth century. This may even be automated through the use of vending machines, where the retailer periodically stocks the machine and takes the money, never meeting the customers. Many stores use "facing" to create the look of a perfectly stocked store (even when it is not) by pulling all of the products on a display or shelf to the front. It is also done to keep the store appearing neat and organized. A third form of retail is virtual retail, where products are ordered via mail, telephone, or online without having been examined physically but instead viewed in a catalog, on television, or on a website. This kind of retailing replicates existing retail types by creating online shops or virtual marketplaces. Retailing has thus become very diverse, with a wide variety of goods offered in many different locations. However, the basic principle of retailing is the same for all—appropriate goods must be made available for sale in an attractive manner, at a reasonable price, and in a convenient location. The concept of a "mall" or "bazaar" with numerous shops located in one area, possibly covered, has a long history and has served all segments of society well. A Bazaar (Persian: بازار) is a permanent merchandising area, marketplace, or street of shops where goods and services are exchanged or sold. Originating from ancient Islamic civilizations, the bazaar is the precursor for the modern day shopping mall, and has had a great influence on the economic development and centralization in modern cities around the world. The Mall, an out-of-town shopping centre at Patchway, near Bristol, England. Escalators connect the upper and lower levels. A shopping mall (or simply mall), shopping center, or shopping arcade is a building or set of buildings that contain retail stores, with interconnecting walkways enabling visitors to easily walk from store to store. It may also consist of a collection of stores all adjoining a pedestrian area, or an exclusively pedestrian street, that allows shoppers to walk without interference from vehicle traffic. The majority of British shopping centers are in town centers, usually inserted into old shopping districts, and surrounding by subsidiary, open-air shopping streets. In the mid-twentieth century, with the rise of the suburb and automobile culture in the United States, a new style of shopping center was created away from city centers. In some cases, large regional and super-regional malls exist as parts of superstructures that often also include office space, residential space, amusement parks, and so forth. Given their wider service area, these malls tend to have higher-end stores that need a larger area in order for their services to be profitable. Regional malls also function as tourist attractions in vacation areas. 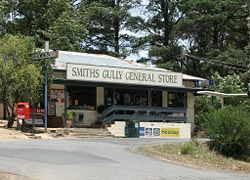 A general store is a retailer located in a small town or in a rural area. It usually has a broad selection of merchandise in a relatively small space. People from the town and surrounding rural areas would come to purchase all their essential goods, both in stock and by special order from larger cities. In the United States, from colonial times through the nineteenth century, they constituted the typical retail unit; but by the 1960s they made up less than 50,000 of the 1,763,324 retail units, and by the end of the twentieth century their numbers had been reduced still further. General stores were the precursor of modern convenience stores, which have gained popularity around the world, still reflecting the basic functions of the general store, while serving a larger, more mobile audience. A few general stores still remain, but more as novelty than necessity. The department store is a retail establishment which specializes in selling a wide range of products without a predominant merchandise line. The purpose of the department store is to cater to the needs and roles of all social classes. Department stores generally sell a wide variety of products including apparel, furniture, appliances, electronics, and additional select lines of products such as paint, hardware, toiletries, cosmetics, photographic equipment, jewelry, toys, and sporting goods. Certain department stores are further classified as discount stores, which commonly have central customer checkout areas, generally in the front area of the store, and usually do not carry brand names. 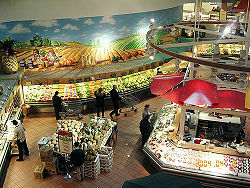 A supermarket is a departmentalized self-service retail store offering a wide variety of food products, such as meat, produce, dairy, and so forth, along with various household merchandise. It is larger in size and has a wider selection than a traditional grocery store. Supermarkets are generally situated near residential areas for easy access and maximum sales. 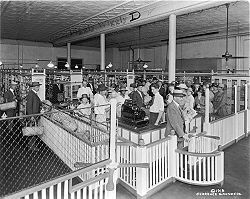 In the 1920s, the first supermarket opened in the United States, heralding in a new era of retail: Self-service. Many shops are part of a chain: A number of similar shops with the same name selling the same products in different locations. The shops may be owned by one company, or there may be a franchising company that has franchising agreements with the shop owners. Franchising is the formal arrangement that allows a dealer the rights to sell products from a company in exchange for revenue and cooperation. Franchising has become a very popular style of business and its reach has rapidly increased since mid-twentieth century. Some shops sell second-hand goods. Often the public can also sell goods to such shops, sometimes called "pawn" shops. In other cases, especially in the case of a nonprofit shop, the public donates goods to the shop to be sold, such as at a thrift store. In give-away shops goods can be taken for free. There are also "consignment" shops, which is where a person can place an item in a store, and if it sells the person gives the shop owner a percentage of the sale price. The advantage of selling an item this way is that the established shop give the item exposure to more potential buyers. A mail-order business sells goods or services by mail. Such a retail business takes orders from consumers without them having to come into the physical store. Many mail-order companies do not have a physically standing store; they take orders through forms sent out in a mail-order catalog and returned by mail, through the telephone, and more recently, the internet. The goods are then delivered to the consumer by mail, rail, or other shipping option. Electronic commerce, commonly known as e-commerce, consists of the buying and selling of products or services over electronic systems such as the Internet and other computer networks. Electronic commerce typically uses electronic communications technology of the World Wide Web, although it frequently depends on computer technologies other than the World Wide Web, such as databases, and e-mail, and on other non-computer technologies, such as transportation for physical goods sold via e-commerce. The pricing technique used by most retailers is cost-plus pricing. This involves adding a markup amount (or percentage) to the retailers cost. Another common technique is suggested retail pricing. This simply involves charging the amount suggested by the manufacturer and usually printed on the product by the manufacturer. In Western countries, retail prices are often so-called psychological prices or odd prices: A little less than a round number, such as $6.95 rather than $7. In certain Eastern economies, prices are generally either a round number or sometimes a lucky number. Prices are often fixed and displayed on signs or labels. Alternatively, there can be price discrimination, where the retailer charges higher prices to some customers and lower prices to others. This often involves a bargaining situation often called haggling, in which the parties negotiate about the price. Another example is the practice of discounting for youths or students, or members of a discount club. Retailers who are overstocked, or need to raise money to renew stocks, may resort to sales where prices are marked down, such as "50% off" for example. Sales are often held at fixed times of the year, in order to be the most effective. The retail industry has brought phenomenal changes to the whole process of production, distribution, and consumption of consumer goods all over the world. Most developed economies rely on the retail industry as their vital growth instrument for a stable economy. In fact, the solidity of retailing lies in its ability to generate a large volume of employment. The boom in the globalization of retail has had a favorable impact in the economy of large nations such as the UK, Germany, and Canada to name a few. The emergence of a strong retail sector can contribute immensely to the economic development of any country. With a dominant retail industry, farmers and other wholesale suppliers can sell their produce directly to the major retail companies, ensuring a stable profit. On the other hand, to ensure a steady supply of goods, retail companies have to outsource and output massive amounts of overhead for the expenses. In general, retailing ensures a more productive industry for the distribution and consumption of consumer products. ↑ Foreign Agricultural Service, Distribution Services. Retrieved December 16, 2007. ↑ Chuihua Judy Chung, (ed.) Harvard Design School Guide to Shopping (Taschen: Köln, 2001). ↑ Larry O'Brien and Frank Harris, Retailing: Shopping, Society, Space (London: David Fulton Publishers, 1991). ↑ International Council of Shopping Centers, ICSC Shopping Center Types. Retrieved May 23, 2007. This page was last modified on 15 July 2008, at 18:08.